I cannot wait any longer to write this review. 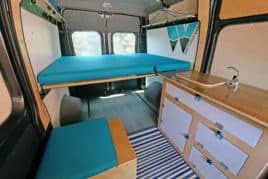 I was putting it off because I didn’t know quite how to convey how much I love my van. A LOT! It is spacious and simple and comfortable. Two of us adults can sleep in the bed. There is surprisingly ample storage in the cupboards. There is a ton of storage under the bed. I haven’t even started to store things on the shelves yet. But I love using them as nightstands. I love the window coverings that pop effortlessly into place. I made coverings for the front windows out of Reflectix. I loved working with Ian. He is kind. He always made time to answer my many questions via phone, text, and email – as I made my way toward my decision of getting a wayfarer van. I am so glad I did. Nothing rattles around. And it smells kind of like wood when I open the door – because he uses the nicest materials he can – like wood and wool. The pro master has been great. I have driven about 60 hours already ( some of it through snow and some of it over 14,000 foot summits ).I like the back up camera and the mirrors that fold in with a touch of a button. It is like a fort. I love it. I will take it camping. I will take it on road trips – where I can either camp in the van or stay in a motel if I want. I will take it to visit relatives – and I can sleep in their driveway, having my own space. It makes me happy. I love to show it to people and I make them listen to every detail about it. So far, they have all loved it too. I was a little nervous about making such a big purchase. So I went to Colorado and saw Ian‘s van. Then I was sure! I love my awesome camper van!